In this episode I talk about my concept of the Core Strengths of your brand, which I believe are 7 areas of your business that are fundamental to seeing success. I talk about your product, your customers, your communication, your marketing, your home base, your logistic (or operations) and your plan. You need to know who and where your customers are. It is also important to determine their demographics (age and income bracket) and their psychographics (attitudes, aspirations, and other psychological criteria). You need a great product. Something that can solve your customer’s problems. It goes back to your customers and how you can address a problem for them. Having your own website can help you relay the backstory of your business to your customers. Your customers get to have a more personal relationship with you and your brand with the knowledge of why you are here and what your business is all about. For more information on why you should have your own website, check my blog post “The 5 reasons why you must have your own website” here. I also have a free course on how you can create your own website and you can check it out here. How are you selling your brand to your customers? What tone are you using and are you being casual, formal or super chill? It is important to form relationships with your customers by identifying how you want to appear to your customers and you can strengthen this through setting up a mailing list. I find this to be the most fun part of having a business. So many people get too caught up on how to increase social media engagement and it actually takes up so much of our time. But it’s important to note that this one aspect is a tiny part of marketing. We need to step back and look at the whole business holistically. Figuring out where you’re going and how to get there. One suggestion is having SMART (Specific, Measurable, Achievable, Relevant, Time-Limited) goals. What I do is I have a yearly intention which I then break down into monthly, weekly, and daily plans to ensure that I can reach my overarching goal. It is very important know the ins and outs of your money. A tracking system that works for you should be in the works to make sure that your business is growing. So, which Core Strength do you need to work on more? Are you confident in each Core Strength? If not, no worries! I am here to help you avoid the massive mistakes I have done in the past and we will go into a more in depth discussion of each Core Strength on the next episode of Makers TV. 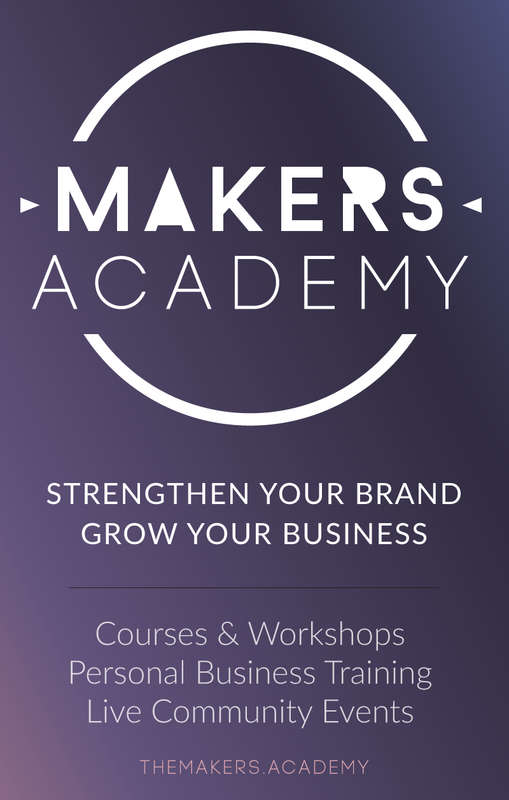 You can also check the Makers Academy for a one on one coaching course with me to make sure that you have a strong foundation and have the best chance possible to grow your business and be successful. It is overwhelming to run a business and it can be very daunting. But always remind yourself that you are in the right place. You CAN run a business. You can be successful. You can earn a really good successful income from making and selling your creative goods! I hope this helps and see you on the next episode of Makers TV!